Welcome to Family Wellness Centre! Welcome to Family Wellness Centre! Everyone in our office, from our receptionist to your chiropractor, has one goal in mind — to help you function better, fast. We know that when your body is not in top shape that your entire outlook on life can be affected. We put your family’s health and well-being first. 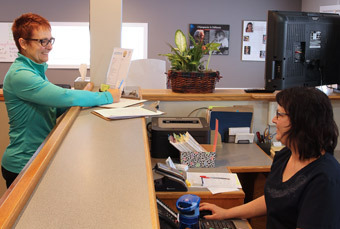 Our staff will warmly greet you and introduce themselves. They will also set you up with your paperwork if you have not already downloaded the forms from our website and completed them at home. We have provided extra time prior to your appointment for you to fill out the forms. You will receive a full explanation of what happens on the first visit before starting with the COREscore™ evaluation scan. You are scored on each test. The COREscore™ is an average of these readings to show us where your nervous system and general health levels are. Dr. Jon will explain his findings in detail with you. Dr. Jon will take an in-depth history and perform a physical examination after completing the scans. Your chiropractic care is based on your COREscore™ and what you are looking for in seeking chiropractic care. If you want to have your pain relieved, we can offer you that. We have much more to give you, however, and hope that you will consider using chiropractic checks to maintain your health. Your first visit with us takes about 45 minutes. Your second appointment is when you will receive a report of Dr. Jon’s findings from your first visit. You will receive your first chiropractic adjustment and choose to commit to care. Please plan on spending about 15-20 minutes with us on this visit. Your next appointments are kept short at around 10 minutes. Dr. Jon talks to all his patients while they are on the adjusting table, providing information to you about specific issues. You can see our ‘’Word of the Week” on the whiteboards in each room where you can guess what the word means in relation to your health. When you learn more about your health, you are empowered to take more control over it. Every 12 visits we will re-evaluate your condition. We ask you to fill out a report card letting us know how your experience has been. The COREscore™ scans are redone every 12-14 visits. If you have been a patient with us for many years, we may do the scans up to every 20 visits. Contact our office today to get started on relieving your pain, restoring your health and rebuilding your life!